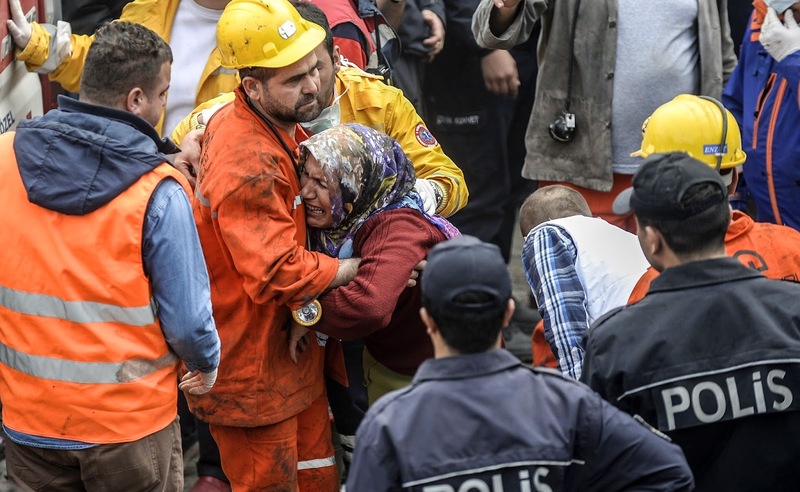 A devastating coal mining accident on Wednesday in Turkey has claimed the lives of over 30 miners. The accident which happened in the town of Soma in the western province of Manica has provoked anger towards the Turkish Prime Minister, Recep Tayyip Erdogan by the media and the people of Turkey and it’s anticipated it could set off mass demonstrations. As Turkey in recent decades has seen growth on growth and is moving closer towards the status of a developed country, so has the country’s appetite for coal in order to meet a surge in electricity demand. It’s in this thirst for coal that the Prime Minister has been accused of easing regulations on coal mining. Locals have talked about hazardous conditions at the mine and the UN body, the International Labour Organisation, have said Turkey are one of the worst offenders on industrial safety standards. According to data from the Mine Workers Union in Turkey, between 2000-2009 there were 25,655 coal mining accidents which injured 26,324 and killed 63 miners. Coal has been earmarked as bad whichever way you look at it and is being attacked from all fronts both on climate, health and safety issues, but currently Turkey are relying on coal for one quarter of their electricity demand. If development in Turkey continues to surge and the government does not enact attractive subsidies for renewable energy generation, that number could quite likely rise even further. In recent years coal have started to emerge as a health issue. In China horrendous air-pollution standards is largely being blamed on coal pollution. The World Health Organisation (WHO) are now saying air pollution is the world’s largest killer. It increases cancer rates, heart diseases and also has a severe impacts on asthma attacks. For climate change it is also bad; scientists are saying coal is the worst in terms of CO2 emissions and governments all over are wanting to be seen taking action on coal. US President Barack Obama has enacted proposals to regulate new coal fired power plants and regulation for existing coal power plants is in the process to be unveiled. He has also confirmed that the US would not fund any coal power projects overseas unless there were no other alternatives. Similar rhetorics are being expressed by the World Bank who say they will close the door for new coal financing. But despite all of this, coal is surging ahead in other countries such as Australia, developing countries like South Africa and the worlds largest CO2 emitter China and even in some EU member states as a result as the EU’s Emission Trading Scheme (ETS) having dropped to an all time low level. The environmental group 350 have acted quickly on the disaster, releasing a petition calling for an end of coal. The group states that Turkey has plenty of alternatives to coal cogeneration and the country has the technologies to move away from fossil fuels. But despite this, the Mediterranean country is hellbent on a coal future and 50-80 new coal plants are currently in the planning.